Last Friday the first part of the Battlestar Galactica series finale aired with “Daybreak Part 1.” After watching this episode I’m revisiting a theory I entertained when I wrote the post Thirteen New Hints About the BSG Last Season, but didn’t articulate then because I couldn’t connect all of the dots. Well, after last Friday’s episode a whole bunch of dots became much clearer. Beware, spoilers follow. Please feel free to read my previous posts on Battlestar Galactica. To briefly recap, in “Daybreak Part 1” we saw Admiral Adama have a change of heart regarding recovering Hera. He asked for volunteers to take part in a potential suicide mission to take her back. Without much success, Starbuck has been talking to Anders to figure out what the Watchtower song means and her true nature. Baltar wants his religious movement to have a voice in the new government and he wants to be their representative. Lee accused Baltar of being self-serving and demanded that Baltar list one time when he acted out of someone else’s best interest instead of his own. Baltar said nothing, but I do think the flashback to the events with his father are pertinent to this scene. While Baltar did certainly not act altogether altruistically with his invalid father, he was adamant on the phone that his father’s caretaker not leave until Baltar arrived, which displays that he at least cares for his father in some twisted way. Later when the Admiral asked for volunteers, Baltar appeared torn, but ultimately chose to stay behind. I think he may later reverse this position, or serve in some other fashion because this element reminds me of St. Peter refusing to admit that he knows Jesus three times. How many times has Baltar been afforded the opportunity to stand up for the truth and he has refused? Baltar has at turns thematically played the roles of a doubting Thomas, a betrayer Judas, and now possibly an unbelieving Peter, all of which dovetail nicely with Baltar’s role as leader of Colonial monotheism. So, characters have chosen to take part, or not, in the raid to recover Hera. Their destination is the Colony, the location of which was revealed — off-camera — by Anders after questioning by Adama and Starbuck. Raptor scouts do indeed find it, but the Colony is located adjacent to the accretion disk of a naked singularity (a black hole with its event horizon visible externally) in the only place where it can avoid being pulled into the hole. There’s only one way in and one way out, and of course every Raider the Colony possesses will be protecting that immovable spot. Anders might have been literally referring to the perfection of mathematics, but he may also have been figuratively invoking the image at the top of this post: The Milky Way. What’s different about this image of our galaxy is that it’s depicted as if seen from underneath and so the arms are spinning opposite from how we normally envision it. 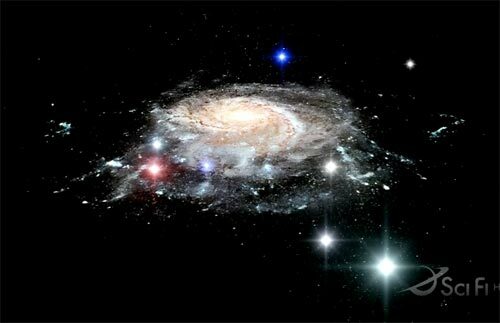 After this image we were shown Caprica from space, so the implication here is that Caprica is in the Milky Way. There had to be a reason for showing the Milky Way from this unusual point of view. I think they’re trying to say that this universe we’ve been watching for the past four seasons is like ours, but not. BSG takes place in an alternate universe. Bear with me while I make my case. Star Trek, whose DS9 show Ron Moore used to write for, is renown for it’s parallel universes complete with goatee or leather-clad opposite characters. For the purposes of this article I’m making a distinction between “parallel” and “alternate,” and am deliberately using the term “alternate.” All those Star Trek episodes used what I think of as a parallel universe where all of the characters have counterparts in both timelines. The term “alternate” avoids the use of these counterparts and allows for the worlds to be very different and possess only a few things in common. If alternate universes are indeed possible, it’s highly likely that we could not relate to these other universes because the differences would be so great. I don’t think that’s something we’re going to see dealt with on a Friday night science fiction TV show. The audience can’t relate to something like that, so it’s not marketable. Good science or not, SF audiences are used to the idea that if there are an exponential number of alternate universes that a small number would be somewhat similar to our own and others would be vastly, unrelatably, different. BSG has taken a middle road approach to this idea. I sincerely doubt (and hope) that we will not see “evil twin” counterparts to the current characters. That is indeed an overused and silly SF trope. Let’s look at how the BSG universe is the same as our universe and how it differs. We’ll also consider how this theory explains those similarities and differences as well as a few of the remaining story questions. There’s been a lot of speculation as what the phrase “Life here began out there” means for the Colonial humans. Does it mean that human life began on Kobol or does it mean that life began somewhere other than Kobol? For this story to be taking place in our own universe, where life began on our Earth, this seems to imply that everything is taking place in the distant future. We humans evolved on Earth and then traveled to the stars, eventually colonizing Kobol. However, a recent interview between Mo Ryan and “No Exit” writer Jane Espenson differs from this assumption. Mo: Was Kobol the original origin point for humanity, or was it Earth? Jane: Iâ€™ve always taken it to be Kobol. How is that possible since we know that (1) humans evolved on Earth, and (2) Ron Moore has said he wouldn’t tinker with evolution? It’s possible if this story takes place in a reality not our own, where humans did in fact evolve on Kobol not Earth. Fans have noted all along that the BSG universe is so similar to ours, but not: They dress like we do, eat what we do (i.e., in “Daybreak” we saw Roslin eating sushi), worship gods once worshiped on our world, have the same songs, etc. We attributed all of these things as an attempt to make the story more relatable to us, but maybe they’re clues. The big clue, however, and one that turns this into a twist instead of deus ex machina ending, is the Eye of Jupiter. We’ve been assuming it is likely Jupiter’s Great Spot. It may however, be the singularity that will dump them out near our Jupiter. 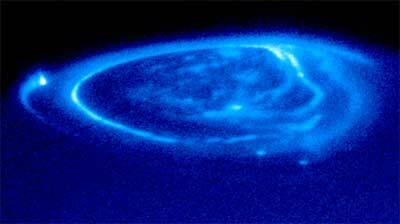 It’s called the Eye of Jupiter because it’s Jupiter’s window into their universe. Michael Hall pointing out that the shot of the Milky Way (just prior to the shot of Caprica in the flashbacks of Daybreak) is upside down and rotating backwards — something that has huge esoteric repercussions — seems to be a Great Big Clue. Hall notes that this is not how it was depicted at the end of “Crossroads,” but the actual shot had the camera pulling back and up away from the fleet’s location, then twisting and reorienting before plunging back into the Milky Way. The Pythia Prophecy and the constellations in the Tomb of Athena led the Colonials to the 13th Colony, their Earth. Michael Hall has noted that they do not quite match the zodiacal constellations as seen in our Earth’s sky. The constellations may have matched those in the sky of their Earth, and if the Pythia prophecy is true, then that makes sense. This alternate universe theory also explains what Michael Hall’s analysis has found: That the fleet is in Earth’s vicinity and yet can’t seem to find it. We’ve speculated that maybe the Cylons, and Athena in particular, have been programmed not to see Earth. Or it could be that they can’t find our Earth because it’s just really not there. 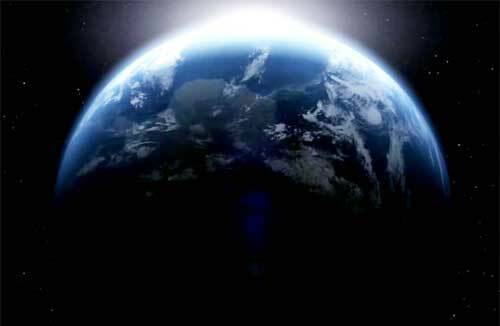 The only Earth in their universe, the planet colonized by the 13th Tribe, has been destroyed. This means the show producers have not been dissembling by saying the cinder planet is the real Earth because it would be “a” real Earth, but not our Earth in our universe. The star pattern behind it is in the ecliptic, when of course from the south pole the background should be the north star and the stars around it. The day/night line crosses around it, instead of going from polar region to polar region as it should. Which means it’s Antarctica, but not quite. (1) That human life began on Kobol, just as Jane Espenson said. (2) That Colonial humans are somewhat similar to us in that they dress similarly, eat some of the same foods, and worship some of our gods, but are in fact very different. They don’t have corners on their papers and books, say “frak” instead of “f*ck,” polytheism is the mainline religion and monotheism is a new development of minority popularity, possess FTL travel capability, have developed sentient robotic life, and live in a 12-planet solar system not scientifically feasible in our universe. (3) The real Earth in their universe was destroyed. (4) They depict their Milky Way from the opposite viewpoint as we do, from underneath instead of above. (5) The 13th Colony/Earth possesses the star patterns depicted in the Tomb of Athena that are similar, but not quite like ours. Also, the planet of Caprica possesses continents similar to ours, such as Antarctica, but their sea levels differ due to the planet being much warmer. This alternate universe theory may explain where Starbuck went when her viper exploded above the gas giant planet in “Maelstrom” and also why she hasn’t been able to retain the knowledge of her trip. How can she hold on to knowledge of something that doesn’t exist in her universe? It may also explain the time differential between how long Starbuck’s Viper said she was gone and how long she was in fact gone in the BSG universe. Time may not flow at the same rate in both universes. This theory does not directly address the head characters. Could there be some kind of communication going on between the two universes? In previous Battlestar Galactica posts I’ve placed a lot of emphasis on the Aurora plotline: that Starbuck has some connection to this goddess and Lord of Kobol as evidenced by the Aurora figurine given to her by the oracle Brenn in Dogsville. Starbuck and Adama later pass this figurine back and forth on several occasions. The Book of Pythia depicts a temple to Aurora on Earth — something that never existed on our Earth. When the fleet arrives at the 13th Colony there is indeed a ruined temple in the foreground that appears very similar to the drawing in Pythia. A deleted scene shows Starbuck discuss Aurora with Gaeta. Considering the finale is title “Daybreak” I think we’ll see another reference to Aurora before the end. As goddess of the dawn, Aurora represents a new beginning for Starbuck and the fleet. A curious aspect of an aurora phenomenon — the ionized plasma light show, not the goddess — is that it has been observed on Jupiter and it’s depiction evokes the Eye of Jupiter that haunts Starbuck. 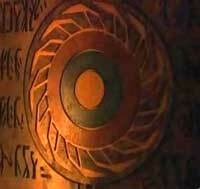 Left, the Eye of Jupiter as depicted in the Temple of Hopes/Five. From a Hero’s Journey standpoint, several developments in “Daybreak Part I” are important. Because religion, specifically polytheism, is fundamental to the BSG story, the depiction of the Milky Way Galaxy as upside down and rotating backwards hearkens to the idea that the Otherworld is the opposite of ours in many ways. The Hero’s Journey as graphically depicted in Joseph Campbell’s book “Hero With a Thousand Faces” spins counter-clockwise, an idea that denotes travel to the Otherworld separate from the Ordinary World. Events do not transpire normally in the Otherworld. An “omphalos” is an ancient Greek religious stone artifact that means “navel.” In Greek mythology Zeus sent out two eagles to fly around the world and meet at its center, which was then regarded as the World Navel. Several areas in the Mediterranean world were designated as the World Navel, but the most well-known of these is the Oracle at Delphi. “The Pythia” was the title given to the Delphic priestess who delivered the oracles and the title derives from the name of the serpent, Python, killed there. Omphalos stones — sometimes referred to as an egg laid by the world snake — like the one at Delphi were thought to provide a direct connection to the gods, and therefore to the Otherworld. Because of this connection to the gods or God, the World Navel is considered to be center of the universe and the point from which life-force enters the world. Many stories have symbolized this immovable point or conduit as a church/temple, forest, the beach or the shore of a river/lake, a mountain such as Mount Olympus, household hearth, the center of the Milky Way spiral, the Axis Mundi or World Tree, the Christian cross, and Celtic cauldron. What matters to me is the perfect throw, making the perfect catch, the perfect step and block. It’s perfection, it’s what it’s about. Kara Thrace has been to Earth, our Earth. She’s been to the Otherworld and it changed her forever, as it will change those who follow her at the end through the singularity. She may lead them down the rabbit hole, the black hole, to another universe. Well, I got half way through before I abandoned ship. LOL! So when this series is FINALLY over, are you done with these epic posts? Just wondering…. It’s all over this Friday. To clarify what I said on my website, the galaxy is shown with counterclockwise arms (from Galactic South) in Daybreak Part 1 and also with counterclockwise arms in Crossroads. It looks like *maybe* the view is from a different side of the galaxy in Daybreak compared to Crossroads, 90 degrees to the right, judging by the red globular cluster visible in both, as well as the blue-white blob where the Ionian Nebula and maybe the Earth are. In the last few episodes, there have been several blatant errors that may or may not be intentional and several things that strain credibility. You pointed out some of the errors, and another one is that Boomer’s raptor regrew its wingtip on the way to the Colony. Meanwhile, the Colony and the possibly “naked” singularity strain credibility. Perhaps projection will have some role in the ending and in explaining some of the weird things that have been happening. Thanks for clarifying the views we’ve seen of the Milky Way Galaxy. I’d forgotten all about the wingtip on Boomer’s Raptor. I’m inclined to think that’s a continuity error by the effects artists. The Colony and the singularity do stretch credibility, but I don’t think Ron Moore is going for a hard SF show. I do hope we see more of how projection works, mostly because I want to know what’s up with the Opera House visions. I won’t be surprised if we find out that everyone is some version of Cylon. So they’re going with “The Black Hole” as their inspiration for the ending? Naked singularities are theoretically capable of emitting light — would we thus see the Fleet plunge into Kara’s mandala as the closing shot? In my memory I mix up “The Black Hole” with “Space 1999.” All I remember is time and space stretching and as a kid I thought that was all kinds of cool. I’m not sure that I *like* this through-the-singularity-alternate-universe-idea, but the evidence does seem to support it. That would be a really neat ending shot, wouldn’t it? An interesting theory. I’d considered the notion that BSG might take place in an alternate universe, but started letting the idea go at the end of season three, when we got that shot of Earth. You’ve got some high-level theorizing going on here, so we’ll see. One small note, though: Starbuck didn’t disappear in the atmosphere of the algae planet. I think you may be getting your episodes mixed up. The algae planet was featured in “The Eye of Jupiter” and “Rapture.” But Starbuck’s “journey” (wherever she went) began on a completely different planet, in the episode “Maelstrom,” when her Viper exploded above the “maelstrom” storm. The key to, then, to how Starbuck was able to travel lies with the “maelstrom.” Some people speculated it might have been a wormhole. But I had a somewhat crazier idea that it might have been a ship — perhaps the re-imagining BSG’s equivalent of the Ship of Lights. Thanks for catching that bit about Maelstrom. I’ll be updating this post later tonight with that information. Honestly, I thought that was the case and looked up Kara on Battlestar Wiki, then must have mixed up the details. I should have looked up Maelstrom. Seriously, this post was a monster to write! Like you I’d thought of this possibility earlier, but gave up on it only to have it resurface. In my memory I mix up â€œThe Black Holeâ€ with â€œSpace 1999.â€ All I remember is time and space stretching and as a kid I thought that was all kinds of cool. Interesting set of things to mix up. As I gather it, though, Space 1999 also used the contrivance of some manner of singularity as well, although I believe this was kind of an “after the fact” point introduced in response to Asimov’s criticisms of the show’s brutal scientific inaccuracy. Iâ€™m not sure that I *like* this through-the-singularity-alternate-universe-idea, but the evidence does seem to support it. It does, at that. Not sure how I feel about it either, and I kind of hope they DON’T go there. But especially given the portrayal of black holes as inter-universal gateways so common to sci-fi, there does seem to be more than a bit of indication that this is the resolution they have in store. That would be a really neat ending shot, wouldnâ€™t it? On the other hand, RDM has listed 2001: A Space Odyssey as one of his primary influences, and I’m expecting a surreal ending. But surrealism can still be hard science if it’s a form of virtual reality. RDM’s planned series Virtuality is based on virtual reality. RDM’s upcoming series Caprica is based on virtual reality. For me, the perfect ending of Battlestar Galactica would be if the survivors agree to enter a virtual reality (perhaps because of being stranded in the Colony.) There, they would find the promised land. This would then leave ambiguous whether anything was in the real world before that or whether they just entered into a virtual reality within a virtual reality. It’s not a prediction – just how I would write it. There’s been a lot of discussion about how well Moore has stuck with his mission statement. IIRC, this was written before the TV execs made changes to his initial proposal, so the only person who really knows is Moore himself. When I think of Virtuality, all I can think of is the Star Trek holodeck. DS9 used that concept to interesting effect, so I’m not surprised to see Moore revisit it. I really hope we don’t find out the whole show has been some virt environment, because that would be akin to “it’s all a dream.” I do, however, like your idea about a blended group living in the colony and making extensive use of projection. Came here via i09 and was hella impressed by your theory. Great work. I expounded on it a bit on my blog: http://boztopia.com/?p=505. I’d be interested in hearing your thoughts. Thanks for stopping by and for linking to my post. You made some good points in your follow-up. Some of what I replied to over on your blog will show up in a post here later today. I could live with an ending like that. It’s better than what I’m expecting.